Switzerland, Collection, 1850-1948, of approximately 760 stamps on album pages with many complete sets; with Federal Coat of Arms (7) Strubels (11), tete-beches (32), imperf seated Helvetias (11) including good high values, later seated Helvetias (32) plus a double impression error, standing Helvetias (37), numerals (30), later with PAX 10fr high value, well represented thereon with some good completion in 20th century, semi-postals mostly used in early issues, airs complete from mint #1 on and rather complete League of Nations issues with better; with owner's total catalog (from Scott, Zumstein & Y&T cats) at $29,650. Switzerland, Collection, 1850-1997, well formed collection in Scott album, with mint and used hand-picked for neat attractive cancels (mostly circular towns); include a nice showing of early classics including a few 1850-52 Cross issues, attractive Seated Helvetias and Standing mostly used, regular issues complete from 1907 on including NABA sheet and PAX set mint, semi-postals lacking only one issue and includes B226 n.h. (cat $700), complete airmails, nice showing of Officials, etc. 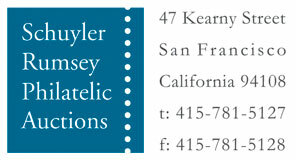 ; with condition above the norm, detailed inventory, owner's cat $11,391. Switzerland, Collection, 1850-62, small collection of presentable used classics on Lighthouse hingeless pages, ranges between Scott 2//40, high catalog value, owner states Scott $11K+, condition varies, generally fine. Switzerland, Collection, 1850-1960, mint and used collection on album pages, some better used earlies including Scott 8, 10, 12, 36-40, including nice run of mint semi-postals from B1-173 including souvenir sheets, also airs, back of book and officials, generally fine to very fine or better. Switzerland, Balance, of 20 covers and cards and various used; used includes 1854-62 Sitting Helvetia ("Strubel") with straight line cancels lot of 31 imperfs, 1934, NABA souvenir sheet with FDC cancel, etc., covers 1900-39 with good FDC's and flights, festival postcards and a few Liechtenstein items; inspect, generally Very Fine strikes. Switzerland, Collection, 1862-2000, attractive mint collection in a well-filled Lighthouse hingeless album, strength in perforated sitting and standing Helvetias, including Scott 41, 44, 45a, 56, 75 with cert, 80, 82-4, 86, 88, 88a, 88b, 121a and 145, also PAX set and many tete-beche pairs throughout, solid collection, owner's Scott $12K+, generally fine to very fine or better. 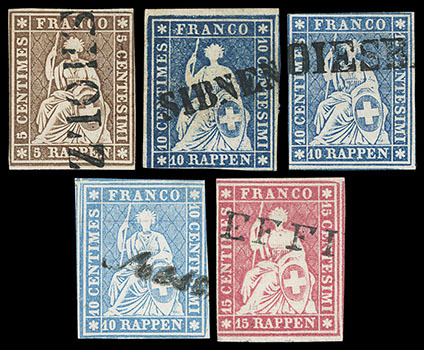 Switzerland, Collection, 1862-2000, all used collection neatly arranged in a stockbook with a high degree of completion for the period, strength in perforated sitting and standing Helvetias as well as Numerals, including Scott 42, 48, 52a, 58, 64, 77, 81, 87b (2), 91 and 92, also 1939 Expo set and PAX set, many tete-beche pairs throughout, owner's Scott $10K. Switzerland, Collection, all mint collection including semi-postals through back of book in a Lighthouse hingeless album, including souvenir sheets B105 n.h., B206 etc., also C1-2, C3-12, C13-15, 101-8, 601-8, 701-19 etc., clean and worth inspection. Switzerland, & Misc. Europe Estate Balance, features stockbook with mint and used Swiss including 1945 Pax set complete and various other sets, singles and souvenir sheets, also an assortment of Liechtenstein mint issues, envelopes with mint and used sorted by country and some covers, inspection recommended, generally fine to very fine. Switzerland, Revenue Collection, 1855-1980's, of 2,224 stamps and 17 documents neatly mounted and written up on quadrille pages in Scott album; includes Federal Issue (216), Cantons with Aargau (445), Bern Municipals (335), Fribourg (82), Geneva (127), Luzern (76), Neuchatel (192) including 6 permits to buy arsenic and 6 to purchase car, Solothurn (43), Thrugau (69), Uri (63), Ticino (489) including 187 municipals, Valais (87) and many others; nice material throughout, 1999 Gainon catalog 13,636 Swiss Francs.